So you’ve been invited to a Jewish wedding, but don’t know what to give the couple? We can help. Of course you can always buy something off their registry, if they have one, but there are some special traditions when it comes to Jewish wedding gifts. We’ve outlined five categories of useful and appropriate gifts for Jewish newlyweds. We hope they ease your gift-giving angst! For a video on “What To Expect at a Jewish Wedding,” scroll to the bottom of the page. The benefit to giving a wedding present related to Shabbat (the Jewish Sabbath) is it enables the couple to use and appreciate your gift every week for years and years to come. 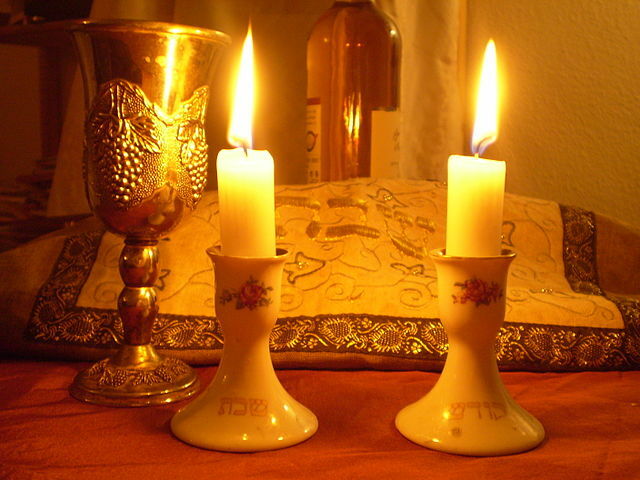 Shabbat begins with candle-lighting and the accompanying blessing. A pair of candlesticks, like this gorgeous crystal set will shine in any couple’s first home. We’re firm believers that a table full of guests doesn’t have to mean a ton of work for the hosts. A lever-style rabbit corkscrew makes opening wine bottles a snap, and this Kiddush fountain with 9 cups does the work of pouring the Kiddush wine for guests. Traditionally after kiddush (the blessing over the wine), guests wash their hands in preparation for the blessing over the challah. With this beautiful silver turquoise washing cup, the couple can observe this custom in style. Another gift that could brighten up their Shabbat table is a gorgeous embroidered challah cover, like this one. All these gifts can be used week after week, setting your gift apart as something special and kadosh (holy), just like Shabbat. Another genre of wedding gifts that we’re fond of giving (and, yes, receiving) are those that ease food preparation and kitchen organization — both important considerations, especially if the newlyweds are kosher-observant. A good and inexpensive way to help the couple stay organized is a three-piece cutting board set to prepare meat, dairy, and pareve foods. This colorful set of 3 cutting boards is bright and fun. Everyone’s into fresh, healthy cooking these days, but what if the couple wants to make a good old classic dish like, say, brisket? Get them a Dutch oven! This Lodge 6 quart red dutch oven is a steal compared to some of the fancier brands. 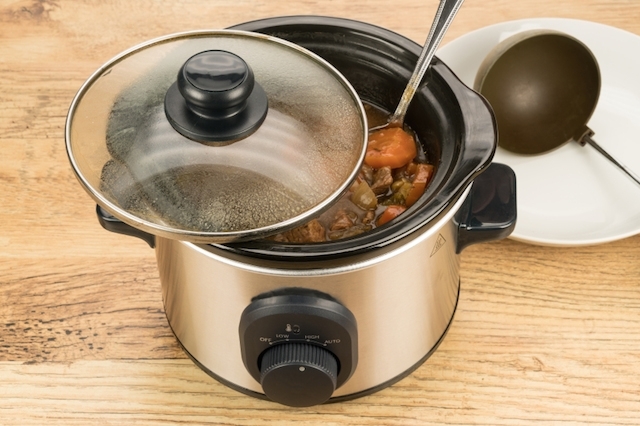 Or, if they want cholent (a slow-cooked stew) on a cold Shabbat day, a crockpot like this Hamilton Beach Stay or Go Slow Cooker is a needed addition to make those yummy Sabbath stews. But don’t forget the potatoes. You can make their potato-grating for latkes (potato pancakes, traditionally served on Hanukkah) unbelievably easy with this Black & Decker 8-Cup Food Processor. And have you ever seen something as ingenious as this nifty Non-Stick 3-Tier Cooling Rack? It’s just crying out for some piping-hot treats. Whether the newlyweds are looking forward to hosting Passover seders and need a seder plate, like this unique Israeli one by Yair Emanuel, or they’re going to be having friends and family over for Hanukkah and could use some extra menorahs, now is a great time to help them build up their Judaica collection. This handmade iron Hanukkah menorah is elegant and sophisticated, and this Copper finish menorah has a more classic air. Or, if you give a Rosh Hashanah honey dish, it can double as a sugar bowl the rest of the year! A couple can store their Sukkot etrog in style in this Yair Emanuel wooden etrog box. A Havdalah set, like this silver-plated one is something they can use each week to say goodbye to Shabbat. Finally, a mezuzah like this gorgeous and funky one, completes any Jewish home. As newlyweds set up their lives together, they’ll need multiple mezuzot, so don’t worry about duplicates. Filled with brand-new dishes and cookware, a newlyweds’ kitchen is a great place to experiment with recipes. We recommend giving both classic cookbooks and some new takes on kosher cooking, which can be great gifts for a couple looking to develop their recipe repertoire. For more Jewish cookbook recommendations, read The Best Jewish Cookbooks to Give As A Wedding Gift. The Whole Foods Kosher Kitchen offers the whole megillah of kosher cooking, with expert tips from a seasoned chef. And for a more contemporary twist, The Modern Menu is a great find. Sections are categorized by flavors and textures, rather than by courses. For a couple that’s looking to expand their soup options, Soup: A Kosher Collection has more than 100 recipes to choose from. And you can help them step up their pareve (containing neither meat nor dairy) dessert recipes with The Kosher Baker: Over 160 Dairy-free Recipes from Traditional to Trendy. Finally, you don’t have to be vegetarian to appreciate Olive Trees and Honey: A Treasury of Vegetarian Recipes from Jewish Communities Around the World. Giving a newlywed couple a few cookbooks is essentially handing them the tools for successful, enjoyable meals for years to come. In Jewish circles it is customary to write checks in multiples of $18, corresponding to the numerical value of the Hebrew word for “life” or chai. If the couple is already fairly established in their home, an appropriate alternative is to make a charitable donation in the couple’s honor. It’s a good idea to check with the newlyweds about their charity preferences, as a donation to a charity that they have a personal connection can be a very meaningful gift. We hope our guide helps you navigate through the whirlwind that is wedding season. And since MyJewishLearning, Inc. is a not-for-profit organization that relies on donations and revenue-raising, we’ll receive a percentage of the proceeds of any purchase you make using our links. Thank you for trusting us to help you with this decision. Here’s wishing you and your loved ones a hearty “mazel tov,” from all of us.